Little Man - What I Say blog: Buzz Show! 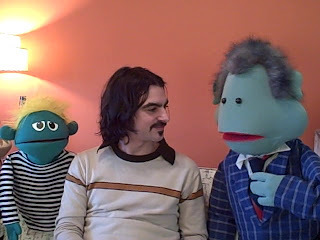 The husband and wife team of Alan Pagel and Laura Wilhelm, of Mad Munchkin Productions, created these characters and I sat with them to discuss some possibilities of the idea of having one or two of their puppets interview me as Little Man in a bunch of different scenarios. We turned on the little Flip-Video camera and recorded these videos off-the-cuff and unrehearsed. As you’ll see the result was hilarious and fun. I also created the Buzz Show theme song which you can get on your cell as a ringtone! People have been loving that.